What else do you require for the funding? The next tranche of funding from Talaxis (£7m) is due on publication of the 43-101 technical report in relation to the updated resource estimate. So firstly the updated resource numbers will be announced and subsequently (not more than 45 days following the resource announcement under Canadian regulations), the 43-101 technical report will be filed on SEDAR, with a simultaneous announcement in relation to the filing, following which Talaxis will invest the next £7m. We expect all of this to happen in the first quarter of 2019. A 43-101 technical report is a very comprehensive report, which The MSA Group, the company and our other technical consultants are busy working on in parallel with the resource update. 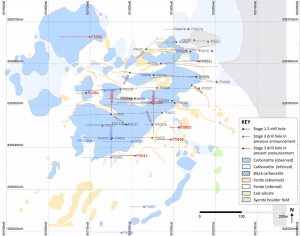 The report will be mainly focused on geology and the updated resource, which will form the basis for an updated mine plan for inclusion in the subsequent feasibility study, the main focus for the balance of 2019. Once the results are drawn up, is there anything else needed to produce that carries risk for the funding? According to our agreement with Talaxis, on publication of a 43-101 report in relation to the resource update, Talaxis will invest the next £7m tranche of investment. Can the team update on the strategy for the other exploration projects at Thambani and Chimimbi? (I notice the Chimimbi project is no longer on the website). In light of recent developments and positive outlook for the uranium market, Thambani will certainly be further evaluated in 2019 and I am very excited about the prospects. Apart from uranium, Thambani also features high grade tantalum and niobium, and widespread columbite occurrences. We are evaluating options for Thambani which may include partnerships and / or a Mkango led programme. Additional work will also be carried out at Chimimbe most likely looking at metallurgical processing options as well as the potential for other commodities in the licence area. Are they being progressed in any way and if so, is enough funding available or are partners being actively sought/ disposal options being reviewed? We do not intend to raise capital via a placing to complete further exploration on Thambani or Chimimbe and envisage that these projects will funded either from receipt of additional warrant proceeds or a partner coming in to fund the exploration at the project level. The work at Songwe is fully funded by Talaxis at the project level. Did the diamond drill programme at the Songwe Hill meet your expectations? The drill results exceeded expectations. The key objective of the programme is to upgrade as much as possible of the inferred and indicated resource categories into the indicated and measured categories. In the pre-feasibility study, the in-pit inferred resource was treated as waste, given that only indicated (and measured) resource categories are permitted to be included in the mine plan and therefore in the reserve. If we upgrade the inferred resource so it can be included in the mine plan, it will potentially enable a longer mine life, increased production, lower strip ratio and lower costs. You have talked about commercialising your key business interests. Do you see 2018 change the dynamics of the company? 2018 was a transformational year for the company, with the first £6m tranche of investment received from Talaxis in January which enabled the company to kick off the feasibility study including the largest drill programme to date at Songwe. The transaction with Talaxis enables a pathway to production and this is the trajectory we are currently on. MKA appointment of new directors further broadens the Company’s international footprint and global network, is this Mkango thinking long term to make the business commercial? The appointment of the three new directors will certainly better position the company for project development, being senior executives with extensive experience in the mining industry, investment banking, project finance and private equity. Under the terms of an agreement with Talaxis (the “Talaxis Agreement”) Talaxis have the option to acquire a further 26% interest by arranging funding for project development, including funding the equity component thereof. How do you see 2018/19 developing and will Mkango be due a market re-rate? You guys have been involved with this REE project for the past eight years, are you now seeing all the hard work pay off? 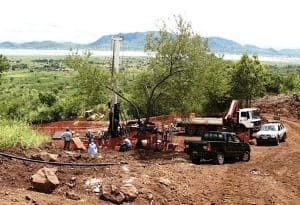 As one of the very few executive teams in the rare earths sector who have been with a rare earths project from inception (in this case from 2009) and sustained the business through a very significant downturn into a now emerging recovery, this is a reflection of our belief in the project, the outlook for rare earths, and in Malawi, which has huge potential waiting to be unlocked. This has been validated by the transaction with our strategic partner, Talaxis, which means we can move the company to the next level. Furthermore, the continuity of relationships and longstanding experience in the country means we are very well placed to move from exploration to production. China supplied 78% of America’s rare earths imports last year and with a trade war looking likely, how well positioned is Mkango in today’s rare earth market to capitalise on this? There are very few advanced stage development projects globally of which Mkango’s Songwe Hill Rare Earths project is one – we are seeing strong interest from both within China and outside China looking for new sustainable sources of rare earths. 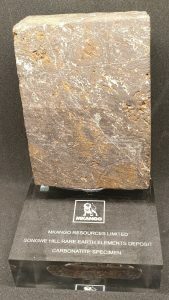 Mkango is very well positioned with an advanced stage project, rapidly advancing through the feasibility stage fully funded by strategic partner Talaxis, in a stable country with good infrastructure, which is key for rare earths development. How have you found being listed on AIM? It was a tough decision to dual list on AIM in June 2016 under what were extremely difficult market conditions but has been proved to be have been the right decision, and we are very appreciative of the loyal support we have received from our shareholders and advisors in the UK and elsewhere, which created a strong platform to grow the company and positioned the company to bring in a partner to move the project to the next level, which had always been the objective.